​This large self catering holiday cottage was built in the 60s by the then Laird of the Island. It is warm and spacious with 4 bedrooms (1 ensuite toilet), sleeping 8 + 2, a large comfortable sitting room, a carpeted hall way, kitchen with multi-fuel stove, downstairs bathroom with a large bath, shower over bath and toilet, washing room with washing machine and tumble dryer, bootroom/porch, and storage room. It has a large garden with extensive lawn and clever planting designed to withstand the robust sea air! Pets welcome, but must be cleaned up after, and not allowed upstairs or on the furniture. ​The sitting room is large and comfortable with windows facing north, west and south, to make the most of the fantastic views. There is a TV and DVD with a large selection of DVDs, plus a multitude of games, ranging from roulette, to rapidough, puzzles and literally hundreds of books will keep you entertained. There is also a piano and a guitar. A good selection of childrens movies will keep the kids happy in the evenings. ​Where it all happens, a table for drinking gallons of tea and often something stronger while looking out at the fantastic view. A table for lots of chat, catching up with your friends and family, heated card games, gentle drawing, delicious meals or just for gazing out to sea. Whatever the weather it is transfixing, with a stove to keep you cosy. ​The Kitchen is equipped with every thing you would need including a recently added dishwasher. 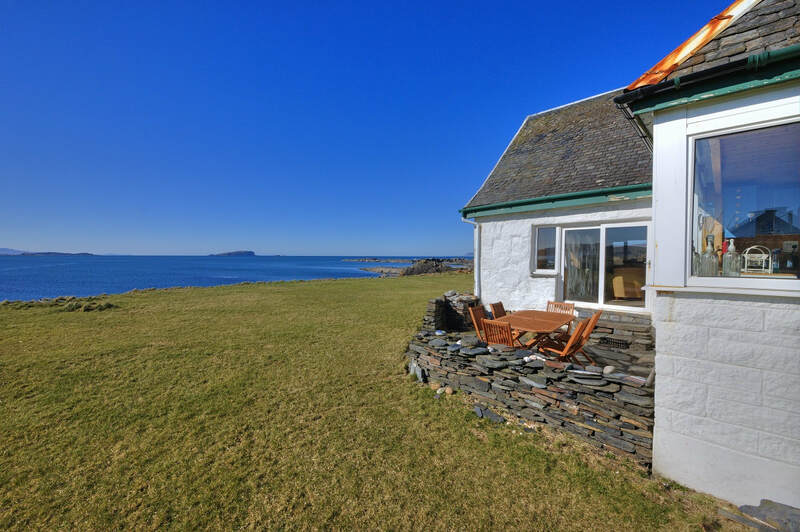 The view from this kitchen is a joy to take in, you'll find it addictive...look away and you might miss the basking shark, dophins, otters and even a minke whale that have been spotted from the house. ​The master bedroom upstairs. Who gets the side next to the picture window looking out to sea...? ​The 2nd upstairs bedroom. A bunk bed with a double bottom bunk and an en-suite toilet. Perfect for the kids, but also suitable for adults! Blow up mattresses available for any extras! 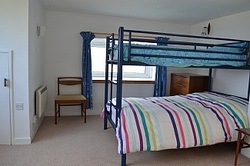 ​A spacious double room with room for a cot if needed. There is one bathroom which is downstairs, with a large bath, toilet, sink and overbath shower. There is an ensuite toilet in the upstairs bunk room. There is also a utility room with a washing machine, tumble drier and sink downstairs. There is also a small sun porch at the back of the house looking onto the garden. The garden is large and flat, ideal for games or just lounging, taking in the sights and sounds.